A settlement was in existence at Hackdirt circa 2E 582, when it was ruled by Mayor Ovidius Celatus. 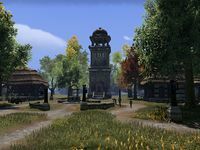 At the onset of the Alliance War, the settlement was located in the territory occupied by the Aldmeri Dominion, but no soldiers were sent to guard it. A newly-formed gang of bandits calling themselves the Black Daggers laid claim to the town, and their leader Vanier proclaimed himself its new overlord. The majority of Hackdirt's citizens promptly abandoned the settlement, sealing their houses and destroying their valuables before they left. The bandits subsequently set up camp at Hackdirt, where many were then killed as an act of vengeance on the orders of Lliae the Quick, the last living member of the Quickstep Bandits. Hackdirt was refounded in the Third Era as a mining town by Irlav Moslin. The villagers discovered a system of natural caves beneath the settlement, and slowly became aware of the presence of the Deep Ones, a mysterious Daedra-like people who lived far underground. The villagers supposedly met with the Chief of the Deep Ones, who taught them his language and runes, and passed on the lore of his people. It was recorded by Irlav Moslin in the Bible of the Deep Ones. The villagers were awed, and began to worship the Deep Ones. Many of the villagers began to live underground in the caves, to be closer to them. They became large-eyed and insane over the years, and were known as the Brethren. Tunnels were dug, connecting every house to the cave network. The Chapel of the Brethren was built above ground, where the other villagers met at "Gatherings" to worship the Deep Ones. The cult's activities eventually got out of hand, and the Imperial Legion was sent to deal with the settlement. Hackdirt was burned to the ground, and the Deep Ones fled. Many of the villagers hid, and began to rebuild the town. An inn and a dry goods store were opened by the Moslin family. 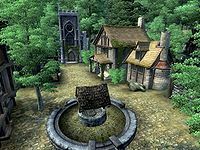 However, the village's reputation had been forever marred, and the inhabitants became overly wary of any outsiders. Worship of the Deep Ones continued, and the villagers planned to make human sacrifices in an effort to bring them back. In 3E 433, a young Argonian named Dar-Ma was visiting Hackdirt when she was abducted by the Brethren and imprisoned underground. Dar-Ma was the daughter of Seed-Neeus, a merchant from Chorrol who regularly did business with Etira Moslin. When she failed to return from her trip, Seed-Neeus enlisted the aid of the Champion of Cyrodiil to look for her. The Champion went to Hackdirt, and discovered that Dar-Ma had indeed made it safely to the settlement, but never left. After being attacked by the Brethren, the Champion was informed of Dar-Ma's whereabouts by Jiv Hiriel, a villager who disliked the idea of sacrificing her. The Champion rescued Dar-Ma from the caves, killing many of the Brethren in the process. It is unknown if any of the villagers survived the ordeal.